1 of 1 In large bowl, mix together blueberries, 1/2 cup light-brown sugar, flour, orange juice and zest. 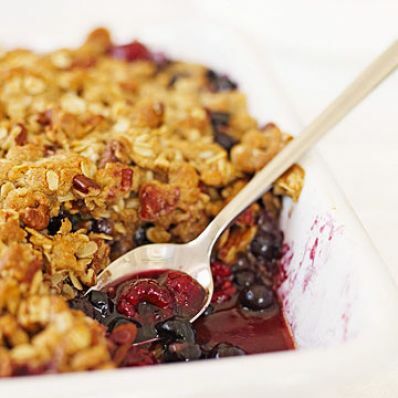 Place into a 6- to 8-cup baking dish. Evenly scatter raspberries over the top. 1 of 2 In another large bowl, whisk together flour, brown sugar and cinnamon. Cut in butter until crumbly. Stir in oats and pecans. 2 of 2 Sprinkle topping evenly over berry filling. Bake at 350 degrees F for 55 minutes, until bubbly. Allow to cool 15 minutes before serving.